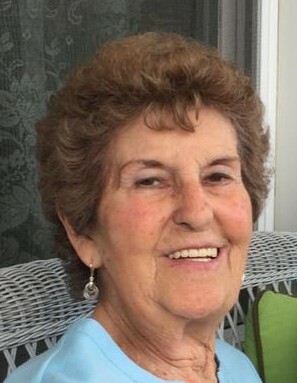 Nashua- Aline C. Gannon, 78, a longtime resident of Nashua, died peacefully Friday, January 18, 2019 at St. Joseph Hospital in Nashua. Aline was the beloved wife of the late William Gannon who predeceased her in March of 2011. Aline was born in Lowell, MA on May 3, 1940 and was the daughter of the late Wilmer A. LeTendre and Jeanne (Thouin) LeTendre. For over 30 years she was employed at AT&T as an assembler until her retirement. In her free time, Aline loved trips to the beach especially to Myrtle Beach where her and her husband owned a mobile home. She also enjoyed reading, watching her soap operas, and spending time with her dog, Tody. Aline would always be cooking, especially for her family and loved her Manhattans. In her younger years she also loved to dance. Aline is survived by her four siblings, Georgette Butkiewicz of Suffield, CT, Paul LeTendre of Dracut, Claire LeTendre of Nashua, and Jean LeTendre of Dracut; five stepchildren, Ed Gannon and his wife Pam of Hollis, Karen Blanding and her husband Mark of Richmond, RI, Sharlene Gannon of Warwick, RI, William R. Gannon and the late Jacqueline Gannon of North Kingston, RI, and Bryan Gannon and his wife Shannon Gannon of Littleton, MA. She is also survived by her nieces and nephews, Linda Kennedy and her husband Tom of Hudson, Sandra Butkiewicz of Suffield, CT, Brian Butkiewicz of Chicopee, MA and Paul LeTendre and his wife LeAnn of Hudson; her seven step-grandchildren and three step great-grandchildren and many helpful and wonderful neighbors. Relatives and friends are invited to Aline’s visitation on WEDNESDAY, January 23rd from 5 until 8 PM at ANCTIL-ROCHETTE & SON FUNERAL HOME, 21 Kinsley Street, Nashua. Her Funeral Service will take place at 7:30 PM in the Funeral Home. Burial will be held privately at a later date. In lieu of flowers, donations may be made in Aline’s name to the American Heart Association, American Stroke Association, 300 5th Avenue, Suite 6, Waltham, MA 02451.